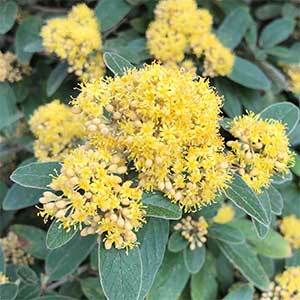 Not widely used in gardens, Pomaderris aurea is a plant that deserves a little more attention. It is not widely found in cultivation as propagation is difficult. 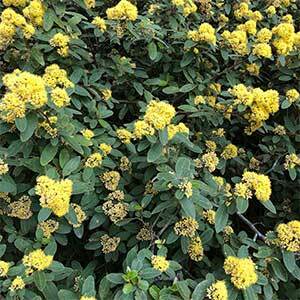 In spring it is covered with masses of dusky golden yellow flowers that attract bees to the garden. The foliage is a good deep green through the year with some indumentum on the underside. This is plant that could be used in the background of a native plant border. It acts as a good screen and is very easy care once established. Good specimens can be found in the Holey Plains State Park near Rosedale in South Eastern Victoria. This is a species from open forest areas and as such grows well in part shade to full sun, however best in a little shade. From seed which will need a hot water stratification. Seed needs to be collected from the plant before it drops, germination can be difficult. Common Name – Golden Pomaderris. Soil – Humus rich moist and well drained. Spread – To around 2 metre. Flowers – Dusky Golden Yellow. Foliage – Mid to deep green with slight serrations.